Hi, this is me again. 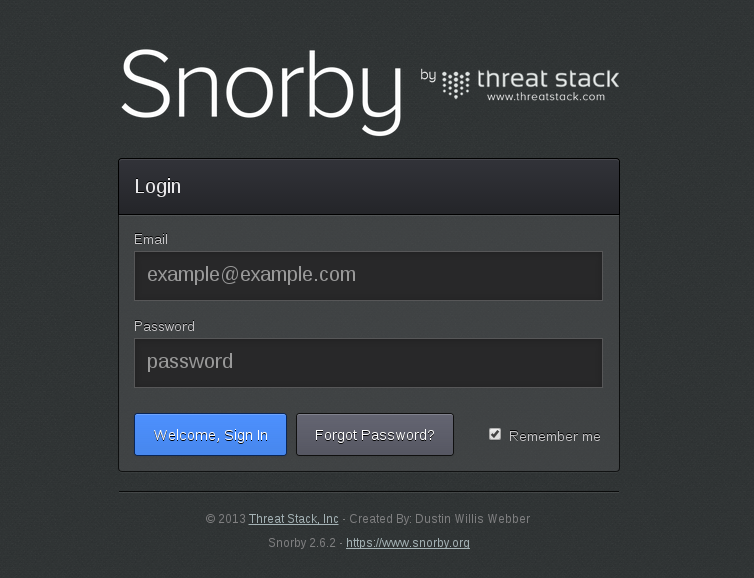 This time I’m offering an update of my old post about how to install Snorby on CentOS as some readers have found some errors and problems. Though I’ve created this post for CentOS 6.5, this article may help you also if you’re trying to install Snorby on CentOS 6.4. Now it’s easier to use wkhtmltopdf and I’ve also added a section to make the installation of ruby cleaner. Ok let’s start! First, we’re installing some packages and we’re also going to install the EPEL repository. Now we are going to download and compile ImageMagick. OK, time for wkhtmltopdf. In the past I had problems with the static version, that’s why I decided to compile it. The latest version works fine for me. Visit http://wkhtmltopdf.org/ and download the latest wkhtmltopdf for your Linux architecture 32 bits or 64 bits. I’m using the 64 bits version. We’re close. Edit the Gemfile.lock file. We need a snorby_config.yml. Then you can edit thing like the domain for your Snorby installation. You have more information about configuration in Snorby’s official page. And that’s it! Snorby is showing the login (user: snorby@snorby.org password: snorby) and the export to PDF function is working for me. I’ll try to offer more information about Snorby in the future. Thank you Parvez and W.White for your comments and please let me know if you find errors. Though there are no prerequisites for this certifications, VMWare offers you free online courses as learning material for these exams once you’ve registered as a user. I’ve started to watch the VCA-DCV modules and they are really good! (maybe you can find your course in your language) and you’ll learn more about VMWare products and terminology. I’ll try to finish the online courses and if the exams are cheap maybe I’ll try to register and take the exams. This old blog post about the associate exams says that the’ll give me 50% off the exam… but maybe that discount has expired.